The murder in Woolwich has shocked everyone, no one was prepared for such a killing on the streets of the UK. The response has been of disgust and condemnation. This incident has raised some questions that politicians and the mainstream media have conveniently dodged. I am disgusted and appalled by what has taken place, but why should I have to apologise for such a crime, it had nothing to do with me. Why is it that Muslims and Muslim organisations are expected to apologise for actions of two individuals? Why is it that Muslim organisations do not even need to be prompted to condemn; they are readily condemning actions that have nothing to do with them. There has been no attempt by Muslim organisations to discuss the causes of the attack, no attempt to question the mainstream media narrative that imposes labels on Muslims. I was born and brought up in a majority Muslim area of Birmingham. I have travelled the country and the world. I have come across thousands of Muslims, spoken, debated and challenged opinions. Radicalisation is not a religious problem, it is a problem of society, and specifically, in this case, British society. Muslim leaders have been scared into silence. Prevent officers visiting mosques and community leaders frighten them. They are told that if Muslims display any political opinions outside the mainstream then they are extremists, that if they do not inform on them, that their bank accounts can be frozen, mosques closed and they could face prison. Muslims are afraid. Muslim organisations and leaders are subservient to the state, scared to mention foreign policy as a radicalising factor just in case they are harangued for justifying the murder. It has got to such a state that we do not even realise that our minds have been conditioned through years of media misrepresentation and widespread Islamophobia. Questioning the reason for a murder does not mean condoning or justifying it. Condemning something that has nothing to do with you feeds into the narrative that this is a Muslim problem, that this is something that the Muslim community are responsible for, at least in part. In turn so-called Muslim leaders stifled debate and discussion in mosques, too afraid to discuss anything political. For too long they have played a subservient role to the state, asking for a seat at the table and hoping for crumbs to be passed to them. 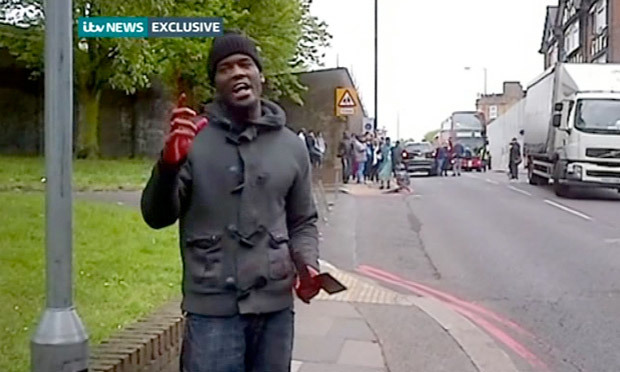 I have not met a Muslim that has condoned the actions in Woolwich, but let’s not ignore what radicalises. British foreign policy radicalises, double standards radicalise, making Muslim youngsters feel like their opinions are not legitimate radicalises, stifling debate and discussion radicalises, not giving people a conduit to vent their opinions and frustrations radicalises, a lack of identity in Britain radicalises, we are either extremists or moderates. We are told that Muslims are equal citizens in this country but the reality is something very different. If we say we don’t drink, we are labelled anti-social or not willing to integrate, if we drink we are labelled moderate, if a Muslim wears a hijab, she is oppressed, if she doesn’t she is liberated, if we express an opinion outside of the mainstream narrative, we are angry, if we join a mainstream political party we are passionate, if we sing the praises of the British establishment we are liberals, if we object to foreign policy we are extremists or Islamists. I for one am fed up of this apologetic and subservient tone. I have nothing to apologise for, I should not be asked to condemn the actions of two men that had nothing to do with me just as a white man should not be asked to condemn the murders committed by Anders Brevik or for the violent actions of the English Defence League. Have Muslims not proved their worth to this country? Muslims have bled for this country during WWI and WWII, they have fought for Empire, they have served as colonial subjects, they have waved the flags, sang the anthems and anglicised their names –Mo and Ed. But still we are not accepted; we still hear ‘Muslim appearance’ in the mainstream media, which basically means non-white, not one of us. I am privileged, I went to university, I had an abundance of left-wing white friends that never questioned my opinions because of my religion or ethnicity, that accepted me as an equal, and made me feel that I had a place in society, we shared our politics as well as our battles. My parents still fear that I will be arrested for writing and expressing an opinion as a journalist. I have been inundated with calls since the attack from Muslims that are afraid of a backlash, one even asked me if there would be ethnic cleansing. I told them not to be afraid because I had faith in the British people to see through the fog that politicians and mainstream media perpetuate. Why is it that Joe Glenton can say that foreign policy is a radicalising factor but our so-called Muslim leaders tiptoe around the issue? Why is it that George Eaton can say that Muslims should not have to distance themselves from the attacks, but our so-called leaders are falling over themselves to do it? Why is it that Glenn Greenwald can question whether the attack is terrorism, but my fellow brothers and sisters are afraid to do the same? I was born here, I am British, I am standing in the tradition that says that my opinion is just as valid as anyone else’s, that I have a right to object to the hypocritical treatment vented out to Muslims without being accused of condoning or justifying such attacks. There are Muslims that will disagree with me, that is fine, we must understand that we are not a homogenous group, Anjum Choudry and his motley crew do not represent me, neither do the Muslim Council of Britain with their 400 affiliated mosques run by old men in committees. Unfortunately non-Muslims in the public sphere represent my views more than our so-called Muslim leaders. To be ‘leaders’, senior Muslim figures must lead. Whilst politicians and the media carry on scapegoating Muslims, a true community leadership must face up to the reality of foreign policy and suppression of Muslim communities over the last decade, and call it out for what it is. Assed Baig is a UK based journalist and has reported from Pakistan, Kashmir, Somalia, Libya and Palestine. He writes on current affairs and issues relating to radicalism and terrorism. He was recently in Burma reporting on the the persecution of the Rohingya. Nice article but I need to ask you one basic questions..if Muslims are facing all these persecutions at the hands of British government because of their faith, why don’t they just leave this place? Because they are settled there, because they get salaries and might have lucrative businesses out there? Well they need to realize that it’s requirement of the faith to migrate from such an afflicted place. Just because you are born and settled there doesn’t make an excuse to stay there and languish. It’s a blockbuster. Just like my lovely white neighbours do not have to apologize for the atrocities committed in Iraq in the name of liberation and hunting for non existent weapons of mass destruction, I do not have to be apologetic of the barbaric crime committed by two mad men and that has nothing to do with me. And when they ask us ‘ do you condemn these attacks committed in the name of Islam’, do they really expect any answer other than, ‘Yes, Of Course’. I mean, seriously, how many times does the world need to be told that Islam has got nothing to do with it. While Talal is asking to leave Britain forgets that most of his countrymen are living in Middle East in the Muslim dominated lands. Those “Whites” who would not get a decent job in their homeland are minting gold in here and happily living with the “terrorists”, why they don’t leave Muslim land and go back?